Do you have gaps in your smile that you would like to see restored? Or perhaps you have teeth that are damaged, cracked, chipped, have a lot of dental work or are in need of extraction. Perhaps you are considering getting dental implants. If so, we would like to offer you the option of having your smile restored and beautified with dental crowns and dental bridges at our office serving the Windham NH, Londonderry, Derry NH and surrounding areas. 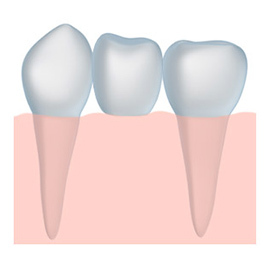 What Is The Advantage Of A Tooth Crown? A tooth crown is made from a durable porcelain material similar to the CEREC porcelain crowns we offer at our office near Londonderry and Windham NH. Dental crowns look like natural teeth because each tooth crown is custom made and color-matched to look natural. A tooth crown feels just like a natural tooth. Dental crowns can also give you that full, complete feeling in your mouth. A tooth crown functions just like a natural tooth. You can eat and chew and your dental crowns can respond just like natural teeth. A tooth crown requires no special care. Just brush and floss and come to our restorative dentistry office in Derry NH near Windham NH and Londonderry regularly. And the bonus is, a tooth crown will never get a cavity! Dental crowns are used with the dental implants procedure and top the dental implant to restore your tooth. Dental bridges are used when you have a gap in your smile that involves several teeth side by side. They are secured between two dental crowns. You can have permanent dental bridges, which are secured permanently to the dental crowns. Or you can have removable dental bridges, that are something like a retainer and click in and out and are secured to the dental crowns with wires. Dental bridges look, feel and function like natural teeth, so smile, laugh, eat and drink as you normally would. We custom make dental bridges to fit your smile, so you look fabulous. We want you to love your smile. Call or stop by today or office serving the Derry NH, Londonderry and Windham NH areas so we can give you more information about tooth crown treatments, and dental bridges.